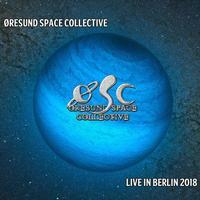 Øresund Space Collective's brand of space rock is improvised, always. That means each performance is unique. Here we get a double CD live set of one such show. It has a great balance between mellower and more rocking stuff. They work through five extended musical explorations. The shortest of those is almost 15 and a half minutes long. They turn it hard rocking at times. It's funky at points. There is some pure psychedelia and a lot more. All in all, this is a killer OSC show. This starts with a rather extended and echoey spoken introduction. The cut rises up with some trippy elements that make me think of early Pink Floyd. While nothing here changes quickly, this drifts through all kinds of echoey space tapestry along the ride. It's tastefully dreamy and space oriented. There are some intriguing bits of psychedelic melody at times along with lot of atmosphere and texture. This piece has a number of peaks and valleys and really does cover a wide swath of sound despite the slow evolution of it. While part of the duration is the introduction, this takes up almost half an hour of the running time of this album, making it a real epic piece on a disc full of epic pieces. Some of the guitar textures around the 19 minute mark get particularly powered up and intense. As it works out from there we get some of the most driving, intense space rock of the whole piece. It drives into even more purely rocking territory as it continues. There is some purely incendiary guitar playing along this road. It reaches a peak and then things end. After the song ends we get more talking, this time earning a bit of a parental advisory. This one rises up with a bit of a funky groove to it. The cut works away from that as it develops. The violin adds a lot to this. The cut drives upwards and onward with intense space rock jamming really soaring. I love the cool jam around the six and a half minute mark. It gets more of a powerful rocking vibe to it. They take it toward more decidedly spacey territory as they drive out from there. More of a guitar rock kind of thing takes over by around the ten minute mark. There is almost a Robin Trower does space rock thing on it at times. It works back out to more typical space music from there. An echoey voice (Dr. Space) introduces the band at the end of this cut. This comes in with a short bit of repeat from the spoken stuff at the end of the last disc. Drums kick in from there, and they start off into a jam that has almost a blues rock groove at first. As it continues there are hints of surf guitar before the serious space sounds emerge. Even then that surf guitar sound is still on display. Eventually it works away from that element and the space jams continue to shift and change along the road. Around the seven and a half minute mark it drops back to a percussion and space sounds movement. It eventually works back upward from there, getting quite rocking as it does so. By around the nine and a half minute mark an insistent rhythmic element is driving more hard-edged and intense space rock. Around the twelve minute mark there is some stuff that feels like a space rock version of the music from a spaghetti western. This works out to more space jamming from there, taking us through a number of shifts and turns as it does so. By around the 21 minute mark (this is over 27 minutes long), we're taken into a section with some seriously hard-edged guitar sounds. It really intensifies as it continues driving onward. The spoken stuff at the end of this track gets another parental advisory. I dig the bass line at the start of this. It's funky and so cool. The cut begins to evolve and grow outward from there. They take us into some killer hard rocking territory as the jamming works through. It peaks around the half-way mark and then drops way down. It starts to rise back up, again making me think of Pink Floyd (Meddle era) a bit as it does so. By around the ten minute mark we're back into more hard rocking jamming. The keyboards takes this into some seriously intense territory as this continues driving upward. As this works ever upward it gets into some of the most mainstream progressive rock jamming of the whole set. It's a real powerhouse that is just so cool. It eventually works through and more stage banter takes over at the end. Rising tentatively, there is some cool and rather playful psychedelia at the start of this. Indian music elements are a big part of this early portion of the track. Then again, they were at the heart of a lot of the psychedelic movement. Even once it's driven its way out to more standard space rock territory that psychedelic Indian element is still built into the jam. They drive this thing ever higher as it works through. It peaks, and Dr. Space talks to the crowd as some more ambient trippy stuff plays. The track continues forward from there, but doesn't really rise back up all that far for a while. It has some cool elements along this part of the ride, though. It gets into some strange electronic territory at points. The stage banter at the end earns another parental advisory.